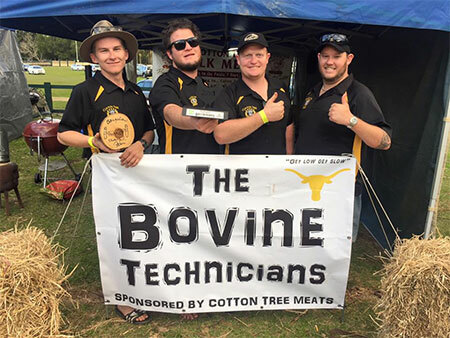 We are “The Bovine Technicians” a competition BBQ team from Cotton Tree Meats and we love too BBQ!! Our team is made up of 3 butchers Luke, Rob & John also a chippy/stonemason Ryan(sheep) we started competing in July 2016 and we have big plans for the years to come. Competition BBQ for is more than just travelling and competing against Australia best BBQ teams, its also about spreading the love of “Low & Slow BBQ” in Australia which has gained massive popularity in 2016. The Bovine Technicians are looking to create an exciting and interactive relationship with our fans, we will keep everyone updated on our results and upcoming events. Check out our discussion board where we will post about our Low & Slow experiences and techniques from competition BBQ through to a Sunday cook up at home.